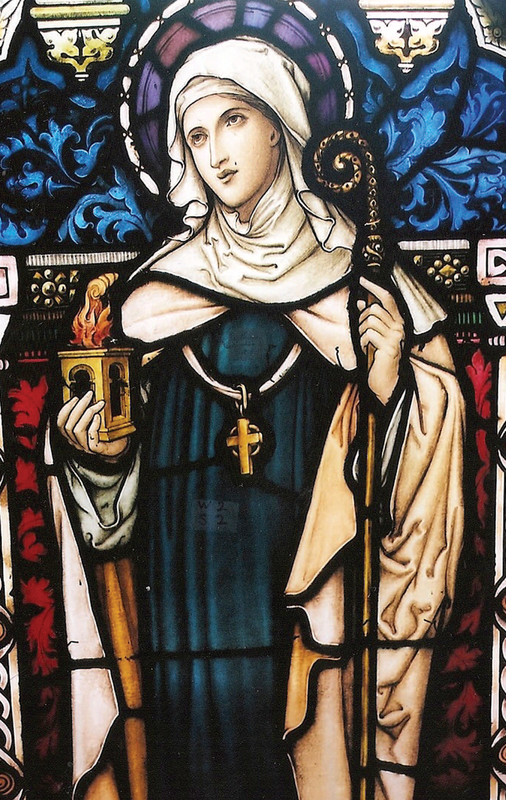 On 1 February, we celebrate the Feast of Saint Brigid, Abbess and Secondary Patron of Ireland. Saint Brigid is renowned for her hospitality, almsgiving and care of the sick. From the archives, Mgr Raymond Murray gives us the history of the saint affectionately known as ‘Muire na nGael’. Click here to download a pdf of the article or read the full article below. Click here for a Saint Brigid’s Day Blessing of the Cross resource in English and Irish. Click here for prayer resources for the Feast of Saint Brigid. According to the Annals of Ulster, Brigid was born in Cill Dara (Kildare) c. 454/8. She is thought to have died in 524. Her father Dubhthach was a prince warrior, a man of noble birth. Her mother Broicseach was one of seven daughters of Dallbhrónach of the Déise Breagh (whence the Meath baronies of Deece). Brigid was attached to a branch of the Fothairt, a hereditary ecclesiastical family within the territory of Uí Fhailghe. The similarity of Fothairt to Fochairt (Faughart in Louth) led to a false claim that she was born in Faughart, a claim made in a middle-Irish vernacular life and in St Bernard’s Life of Malachy. Brigid’s church in Kildare attained great importance and even vied for supremacy in contest to Armagh. An early life of the saint in the seventh century by Cogitosus claimed a wide jurisdiction for it. Many lives of the saint followed, four in Latin and three in Irish, an indication of her popularity and her reputation for holiness. Ireland in Brigid’s time was a patchwork of little kingdoms, half-pagan half-Christian. One calls to mind Patrick’s prayer of thanksgiving in his Confession that he had lived to see the sons and daughters of the Irish nobles – once his opponents – now entering the religious life. Tradition tells us that Brigid in her turn wanted to follow suit but faced opposition from her father and brothers who would have preferred marriage, wealth and social status for this beautiful, accomplished woman. What can we learn from Brigid’s life? What was her sanctity that so impressed her contemporaries and later generations who have venerated her in Ireland and Europe and wherever the Irish have travelled? The anonymous late 8th- or early 9th-century author of the saint’s vita prima presented Brigid as an itinerant saint combining the contemplative life of her nuns in community with an outreaching missionary zeal to the surrounding area and to places in Connacht, Munster and Ulster. She undertook missionary journeys like Paul! Again tradition, so emphasised in the St Brigid’s crosses, recalls that Brigid’s zeal went back to a sermon she and seven other young girls heard from Bishop Mac Caille who received their religious profession when they became nuns. He had preached on the Eight Beatitudes – the opening of Christ’s Sermon on the Mount. So much did his sermon affect them that each chose a Beatitude as a motto for life. Brigid chose mercy – ‘Blessed are the merciful for they shall have mercy shown them’. She practised a self-sacrificing mercy to the poor and the hungry. She gave away as much as she could – a merciful virgin who gained the title of ‘Muire na nGael’ (‘Mary of the Gael’). In Brigid’s eyes the poor belonged to the great family whose father was God. They were the needy sisters and brothers of Christ and while their bodies were being catered for the light and truth of Christ was to nourish their souls. Britain and Europe were conquered by invading peoples at that time and Ireland was thrown on her own spiritual resources at a time when the organization of the Irish Church was far from complete. 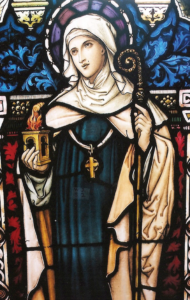 Brigid, abbess of Cill Dara, came to be an important Christian leader in a large area of Leinster and found herself exercising spiritual leadership in her immediate neighbourhood. Brigid saw the need for a bishop and priests to carry on Christ’s work for salvation and sanctification among the people. She invited a holy and learned man, Conleth, to her convent. When Conleth received episcopal orders, disciples came to him and his house became a double-monastery, one for men and one for women, the sole example of its kind to be established in Ireland, though double monasteries were common in eastern Europe and in Italy, Spain, France and Britain. Brigid made an indelible deep impression throughout Ireland. Holy wells and churches bear her name. Pilgrims still visit Fochairt (Faughart), already mentioned. There are two great pilgrimages there every year, one in Irish and one in English, and visits are made to St Brigid’s Stream and St Brigid’s Well. There was also a custom associated with devotion to the saint – the use of a piece of cloth called the Brat Bríde on her feast day, the first of February, as a sign of her protection. Other folklore traditions are superbly dealt with by Séamas Ó Catháin in his book The Festival of Brigit – Celtic Goddess and Holy Woman (1995). Her cult is still pursued in Scotland and England, the Netherlands, France – especially Brittany – Germany and Italy, where there are churches dedicated to her name. Irish missionary monks brought devotion to her onward from the end of the sixth century. Two great experts have outlined these in their books – Tomás Ó Fiaich in Gaelscrínte san Eoraip (1986) and Róisín Ní Mheara in Early Irish Saints in Europe (2001). Click here for more prayer resources for the Feast of Saint Brigid.